On February 01, the Finance Minister will announce his last full-year budget before the Lok Sabha elections. On the back of sagging agricultural growth and rising fiscal deficit, the budget is not expected to be radical this time. Yet, keeping in mind interests of various stakeholders of the economy, the government will have to do the balancing act. Right from farmers to industrialists, representations from all sectors have presented their wish-list to the Finance Minister. Now it remains to be seen how many wishes are granted. To allow taxpayers save more, the Budget 2018-19 may increase the tax deduction limit under Section 80C from Rs 1.5 lakh at present to Rs 2 lakh. Since contributions to the Employees' Provident Fund (EPF), repayments on home loan, and tuition fees, etc., qualify as deductions under Section 80C, many taxpayers exhaust the overall limit of Rs 1.5 lakh within these categories. In other words, there's no incentive for them to invest in Public Provident Fund (PPF), Equity Linked Savings Schemes (ELSS), and other investment avenues eligible for the deduction. If the government increases the limit by Rs 50,000 indeed, taxpayers in the 30% tax slab would additionally save Rs 15,450. Savings for those in the 10% and 20% tax slabs would be Rs 2,575 and Rs 10,300 respectively. In 2017, nearly 54 lakh individuals paid taxes for the first time. Similarly, the Goods and Services Tax (GST) will considerably improve the government's indirect tax collections in the long run. The rich / well-to-do and middle-class are hopeful that the government will offer concessions in tax rates since the tax base is widening. Nonetheless, constraints on the revenue collection may not provide much room for the government to cut tax rates aggressively. Reshuffling tax slabs appears to be another alternative. Salaried people only claim conveyance allowance as the incidental expense. On the other hand, the business class claims expenses under various heads. There's a possibility that several out-dated deductions will be abolished and one standard deduction at a predetermined rate is likely to be offered henceforth. Various industry bodies have suggested Rs 1 lakh as the amount of standard deduction. For example, if your gross salary is Rs 6 lakh, you will be able to claim the deduction of Rs 1 lakh straight off irrespective of having actually spent it. This will subsume various deductions which effectively only a handful of salaried individuals claim. In 2006-07, the UPA government had removed the standard deduction. There's unanimity among industry players on the issue of reduction in corporate tax. The general sentiment of industry leaders is India can't afford to hold tax rates unchanged, especially at a time when other countries are slashing tax rates to encourage investments and boost demand. The government wants nearly 40 crore citizens to upgrade their skills by enrolling in the various initiatives of the "Skill India" programme-a flagship skill program that endeavours to improve the employability of the Indian masses. Moreover, experts expect the government to launch National Employment Policy (NEP) in the Budget 2018-19. This will lay a foundation for rapid job creation in the various sectors of the economy. The government is expected to increase the budgetary support to the Pradhan Mantri Fasal Bima Yojana (PMFBY) by 21%. The PMFBY is the subsidised crop insurance scheme, wherein the farmer pays a nominal amount as a premium and can claim compensation of upto 100% of the losses incurred. To boost the farmer's income, the government is expected to tweak contract farming rules with the motive to encourage corporate investments and participation in India's agriculture sector. Agriculture contributes roughly 17% to India's GDP. Any policy improving the state of agriculture would have trickle-down effects on other areas as well. To push its Housing For All programme, the government may increase the budgetary allocations to Pradhan Mantri Awas Yojana (Urban) by as much as 3 times from Rs 6,200 crore allocated in the last Budget. Also, the first-time home buyers may expect some additional tax incentives. India spends nearly 1.6% of its GDP on defence which is lower than the global average of 2%-2.5%. China's defence spending is almost 2.1% of its GDP, and that of Pakistan is 2.36%. Modernisation of defence equipment is one of the top priorities of the current government. 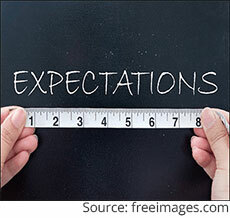 As an investor, it is best to avoid speculating on whether any of the above expectations will be fulfilled. Continue to follow your personalised asset allocation and consider your financial goals and the risk appetite before investing. To learn how to save income-tax optimally and legitimately, download PersonalFN's latest Comprehensive Guide on Tax Planning. It will provide you insights to reduce your tax burden quickly and smartly. Invest sensibly after doing enough research. If you are going to look at the tax incentives offered by a product, ensure it is in line with your personal financial plan. Equitymaster requests your view! Post a comment on "Here's What You Can Expect From Budget 2018...". Click here!